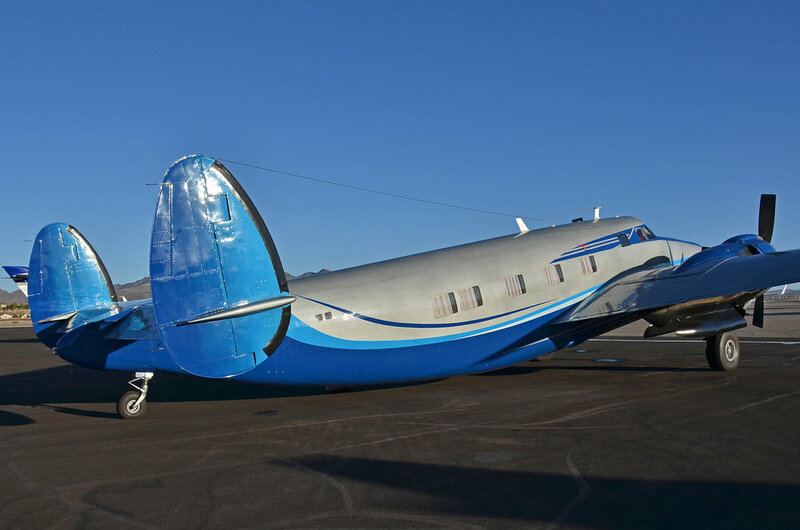 In October 2017 Visual Approach Images was invited on board one of the two remaining airworthy examples of the Howard 500 during the annual NBAA convention in Las Vegas NV. Owned by TP Aero Services of Anoka MN, N500LN was based at Henderson airport during the 3 day convention, where the company were promoting the airplane for corporate and promotional work via a newly launched "shares" programme. 100 hours per year blocks are being offered to companies interested in using the airplane for promotional, corporate and social events. The immaculately maintained and presented airplane is one of very few of the type originally built in the late 1950s, and both the two surviving airworthy airplanes are owned by TP Aero and based at Anoka County airport, near Minneapolis, MN. The Howard 500 has a very interesting background to its development, but the use of proven components meant it was utilising older technology, and therefore competing against much newer and integrated designs - this of course limited its success in an increasingly competitive market and lead to few examples being built and delivered to customers. However despite this, during the 1950s and '60s, Howard Aero Inc of Texas were embarked on a programme of remanufacturing military surplus Lockheed Model 18 Lodestars and Lockheed PV-1 Venturas in an effort to gain a share of the emerging executive market. After producing various models based on prior Lockheed military designs which generally increased in both size and range, the largest model appeared in 1959 - the model 500. Designed by Dee Howard and Ed Swearingen, the Howard 500 bore a strong resemblance to the Lockheed Lodestar and Ventura aircraft, but it was a substantially new design - all 500s had completely new fuselages. The only major components taken directly from its Lockheed forebears were the outer wing panels (from surplus Venturas) and undercarriage (from Harpoons). Howard purchased the wing and fuselage jigs from Lockheed to use as patterns for jigs to build the new aircraft. The fuselage differed from the previous models in that it was designed from the outset for pressurisation, and the wings were designed with extra fuel tanks for increased range. The pressurisation system maintained a sea level cabin pressure at up to 16,000 feet. The engine chosen to power the 500 was the latest high output version version of the Pratt and Whitney R-2800 that had been developed for the Douglas DC-6 airliner. Propeller hubs were taken from the US Navy F4U Corsair fighter, and the four-blade propellers and spinners from DC-7s. The Howard 500 was, however, the last radial-engined passenger transport airplane ever built - a sign of the way aerospace technology was advancing and leaving such legacy designs behind. The Howard 500 cockpit - a very spacious flight deck compared to many later designs. The airplane has been lovingly restored and the cockpit modernised with full IFR airways instrumentation and Garmin GPS. The original multi-lever engine controls and other 1950s avionics remain however - a stark contrast to todays push-button EFD flight decks. The Howard 500 could accommodate 10 to 14 passengers with a large window for each. Increased fuel tankage over the Lockheed Ventura (including tanks in the wings) gave a maximum range with full reserves of 2,600 miles. Maximum cruising speed was 300 knots at 21,000 feet . This exceptional performance for a piston engined executive aircraft unfortunately came just as the competing turboprop designs were coming to the market - most notably the Rolls Royce Dart-powered Grumman Gulfstream I - and this restricted sales of the Howard design. The prototype first flew in September 1959, and certification was achieved on February 20, 1963. By this time, however, the executive market was already becoming dominated by turboprop aircraft, and although its performance was comparable to (or even better than) these new machines, and its price substantially lower, the Howard 500 could not effectively penetrate the market. 17 Howard 500s were produced in the early 1960s, with the last two surviving airworthy examples still flying under private ownership in 2017. A late afternoon take-off from Henderson saw us head south east of Las Vegas and out over the Lake Mead National Park. The low sun picked out some stunning views as we gently circled the area at 3500 feet. Lake Mead basin and the Grand Canyon area hosts some very heavy VFR traffic - most notably the various helicopter companies providing tourists with some spectacular memories from their trips deep inside the Grand Canyon National Park. 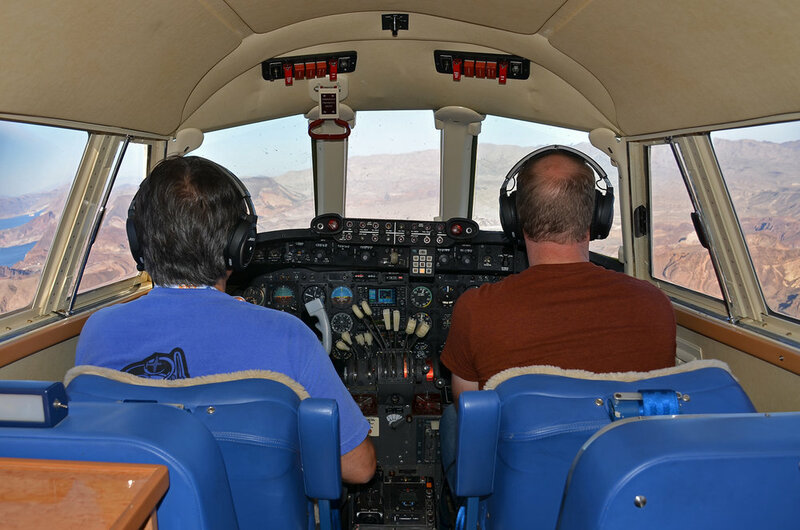 Combined with the fixed wing element such as DHC-6s and Beech 1900s operating at the higher altitudes, it is very much an "eyes outside" environment and a good scanning technique and situational awareness are essential to flight safety. The late afternoon sun reflects off the Colorado River as we head west from Lake Mead and back towards Henderson airport. The Howard 500 flight deck offers extremely good vision thanks to its large and extensive glass panels. This legacy benefit stems largely from the original design brief when the airplane was used for costal surveillance, anti-submarine and search and rescue operations, where good all-round vision was essential. 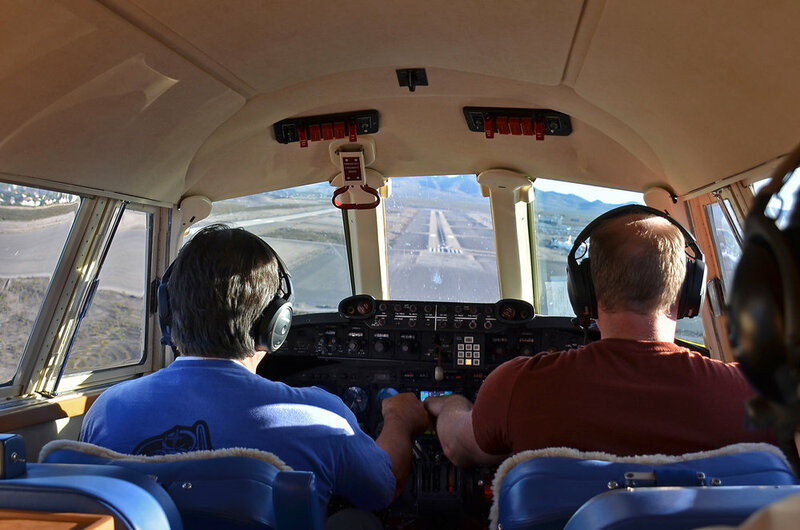 Pilots appreciate this feature in busy airspace and when positioning for a visual approach in tight traffic patterns such as Henderson. N500LN short finals to runway 17R at Las Vegas Henderson after our trip around Lake Mead. My sincere thanks to pilots Bill and Brian, TP Aero staff Jason and Toby and of course to TP Aero owner Tony Phillippi for this once in a lifetime opportunity to fly on board this unique and historic airplane.